The Emperor Jehangir (reigned 1605-27) was, like his father Akbar, a great patron of the arts. Under their enlightened and spirited rule Mughal India embraced the cosmopolitan influence of Persian, European and Indian styles, all of which are to be seen in this image of Jehangir astride an elephant, surveying the scene of his hunting triumphs. The narrative is captured in the jewel-like detail, the bright and engaging colours, the delicate strokes and the delight in beauty. In the more distant reaches of the painting a leopard savages its prey amid green rolling hills, with part of the emperor's retinue visible on the right. 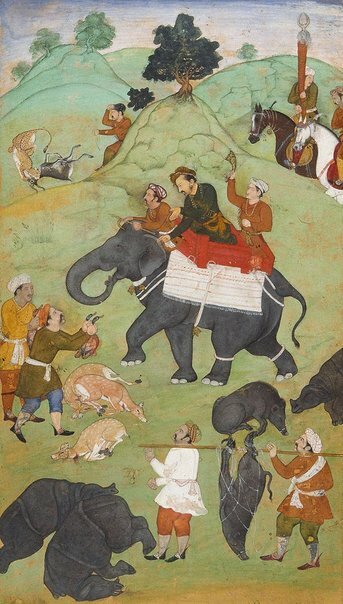 The centre is dominated by Jehangir on his elephant, his attention caught by the attendant holding a pair of geese; and in the foreground two more attendants carry dead boar. Typical of the Persian influence in Mughal art are the luminous greens which contrast so richly with the metallic grey of the elephant; the use of relative scale to convey the significance of the subjects; and the interlocking hills interspersed with figures that delineate a kind of perspective. Art Gallery Handbook, 1999. pg. 291.